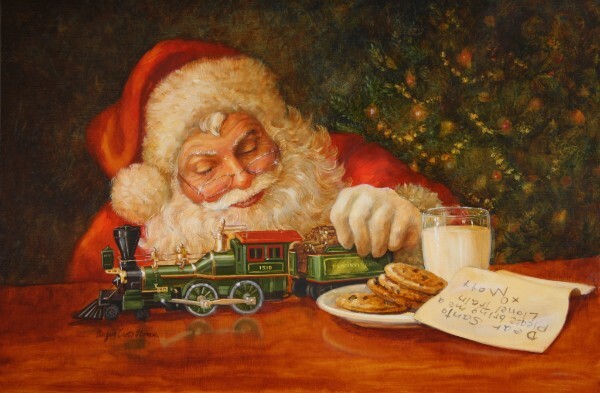 What is it about Christmas that always brings to mind the magic of trains? Not that long ago, everyone left the big cities and went home for the holidays--and they traveled by train. Trains brought Christmas cards and packages from relatives far away. Before the Red Rider BB Gun, children got Lionel Trains for Christmas and many of these (grown) children still set up their tracks and towns every year. Well, in that spirit, we decided to look into Charleston’s history with trains and it shouldn’t be a surprise that we found some interesting tidbits--even one that’s specific to Christmas. Sound the whistle! In the 1820s, Charleston was losing a lot of export business as inland planters increasingly used Augusta’s boats to ship products down the Savannah River to the port of Savannah. Charleston obviously wanted to get the port business back, but how? For years, the English had been experimenting with railed roads that could carry specially designed cars and carts--these could be built much more cheaply than wide planked roads. Some railroad cars were horse drawn, some cars had sails for wind power, and the latest was steam power driven locomotives--much faster than the fastest horse. According to Thomas Fetters’ The Charleston & Hamburg (2008), some prominent businessmen in Charleston, including William Aiken, determined that a railed road made sense. Aiken suggested that the road connect the little town of Hamburg, just across the Savannah River from Augusta, to Charleston. The men anticipated their railed road would triumph over the Savannah River steamboats and in December, 1827, were given a charter for the Charleston and Hamburg Railroad (C&H RR, which later became part of the South Carolina Canal and Railroad). After conducting several surveys, they determined that the best route was a 135 mile stretch going straight north from Charleston between the Ashley and Cooper Rivers to Summerville, then northwest and west before dropping south to Hamburg. But how would it actually work? Experts declared that anyone travelling 30 mph would would be unable to “breathe and would expire from suffocation.” Probably not too many people were willing to find out. Original route of the first scheduled passenger train in America. Map by Thomas Fetters in The Charleston & Hamburg. Before long, six miles of tracks were laid, all the way up to a marshy area near the cemeteries called San Souci, and the company acquired the first American-built locomotive steam engine. Exciting times! Away we flew on the wings of the wind at the speed of 15 to 25 miles per hour, annihilating time and space...leaving all the world behind. It was nine minutes, five and one fourth seconds since we started and we discovered ourselves beyond the forks of the state and Dorchester Roads...We came to Sans Souci in quick time. Here we stopped to take up a recruiting party, darted forth like a live rocket, scattering sparks and flames on either side, passed over three saltwater creeks, hop, step, and jump and landed us all at the Lines before any of us had time to determine whether or not it was prudent to be scared. 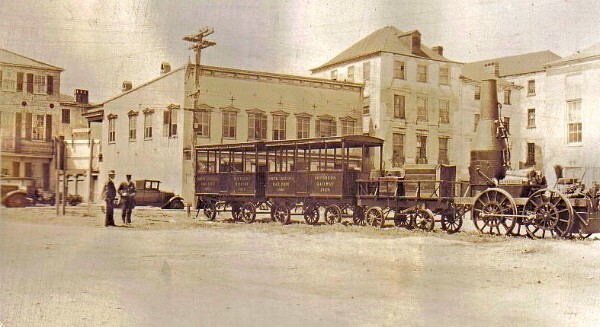 The first trip of the Best Friend of Charleston was celebrated around the world and launched the first regularly scheduled passenger train to operate in America. The Best Friend brought a very Merry Christmas to Charleston that year! The C&H RR was the first to carry mail and when it was completed in 1833, it was the longest railroad in the world. Yes, it’s true--Charleston’s accolades and notes of distinction date waaaaay back! 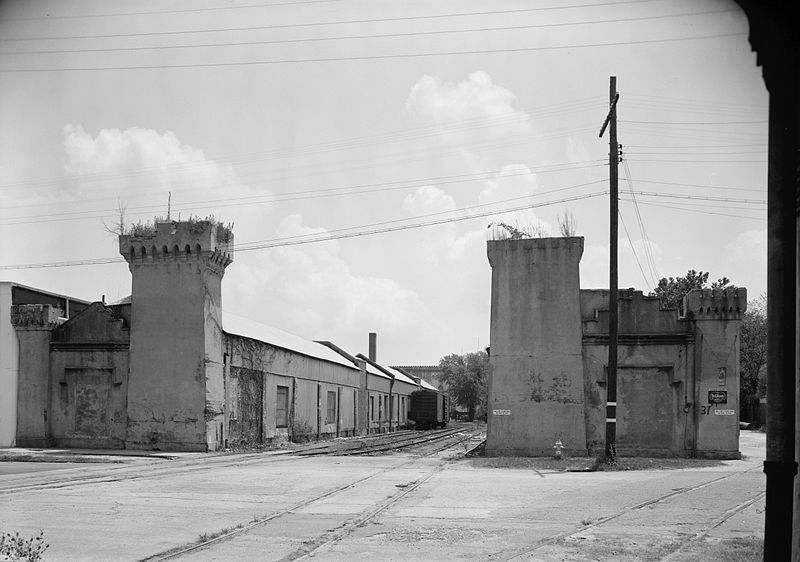 Of course, all of you railroad aficionados out there know that there are at least a zillion interesting stories to tell about Charleston’s railroads, but for now we’ve got just one more. Fourteen years after the founding of the C&H RR, the Charleston & Savannah Railroad (C&S RR) was chartered by a coalition of lowcountry planters, merchants, and politicians headed by state senator Thomas Drayton. The railroad was meant to revive the importance of the two large coastal ports, Charleston and Savannah, by placing them on the shortest route between the Northeast and the Gulf Coast. Local support was weak, however, since neither city cared to help their competition and few wanted the Federal money that was required to complete the project. 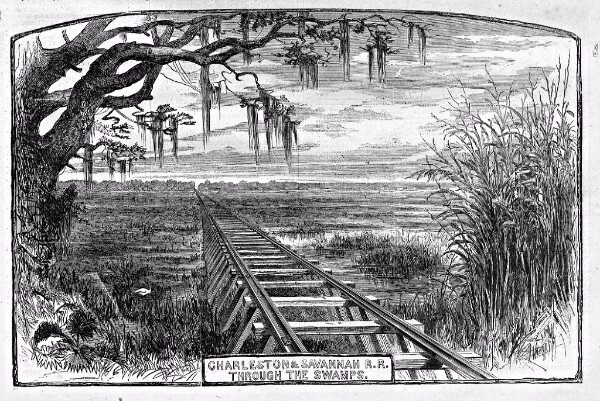 The 120 mile railroad proved difficult to build over swampland and marshes; it finally opened in 1860, only six months before the Civil War. And according to David Stone’s 2008 book, Vital Rails: The Charleston & Savannah Railroad and the Civil War in Coastal South Carolina, it did indeed play a vital role in the war. The Charleston terminus of the line was on the ill-advised west side of the Ashley River, in today’s Albemarle Point area at the end of the West Ashley Greenway. Passengers and goods had to be ferried across to and from the peninsula. After the start of the war, the railroad proved its value as a means of communication and for transporting troops and supplies. 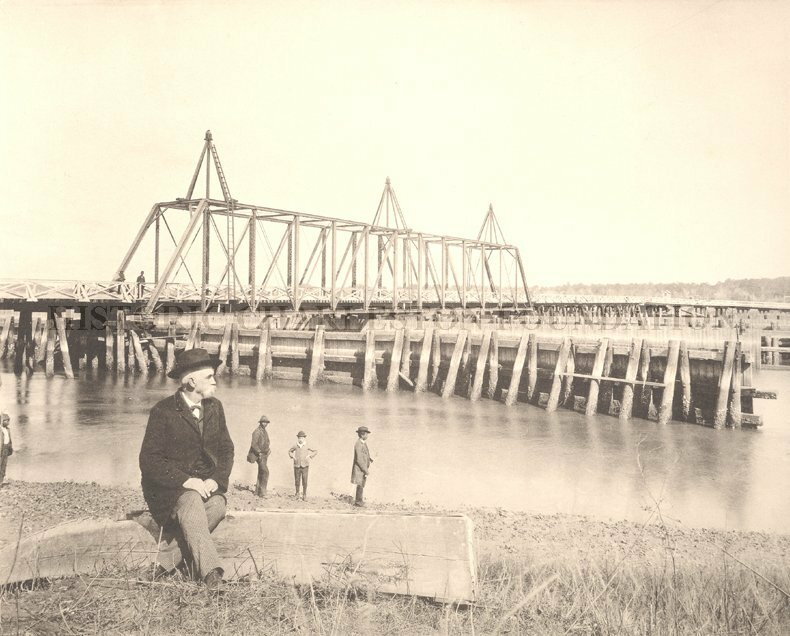 The Confederate government considered the connectivity of all the local railways imperative, so in 1861 it authorized the building of a railroad bridge across the Ashley River to connect the C&S line to the other lines that terminated downtown. The railroad was essential in containing Union attacks on Charleston after the fall of Beaufort; it was the objective of eight battles and skirmishes with Union forces but the Confederates held strong. As Sherman was headed to Atlanta, the Governor of Georgia, Joseph E. Brown, gave the order to “pick up the best engine you’ve got and hitch on as many dead locomotives as she can haul, load the shop machinery into the cars and get the whole shbang to hell out of town.” The refugee train skirted around the tracks of South Carolina and Georgia, sometimes narrowly missing Sherman’s bands of men and months later, after travelling over 700 miles of tracks, returned to Atlanta without a single piece lost to enemy action. But it wasn’t until General Sherman’s army took Savannah in December 1864 that the Union forces had the strength to mount a successful campaign against the railroad. And, boy, did they. General Sherman’s “Bummers” methodically took apart the tracks of the C&S: the rails were placed over bonfires and twisted out of shape, the telegraph wires were cut and destroyed, and the ties were burned. If this wasn’t a bad enough blow, Union General Edward E. Potter found and destroyed the treasure that the Confederates were trying to hide--16 locomotives and 245 cars--ten days after General Lee had surrendered at Appomattox and the war was over. Poor communications, evidently. What a pity. Camden Station. Y’all really should go visit the second replica of our first steam engine at the new Best Friend of Charleston Museum. The William Aiken House and all of the railroad-related structures are listed on the Historic Register and have been renovated and repurposed. It’s the area off of King Street around Mary and John--it’s the perfect time of the year to honor our Best Friend and you’re gonna be shopping on King Street anyway! Albemarle Point. 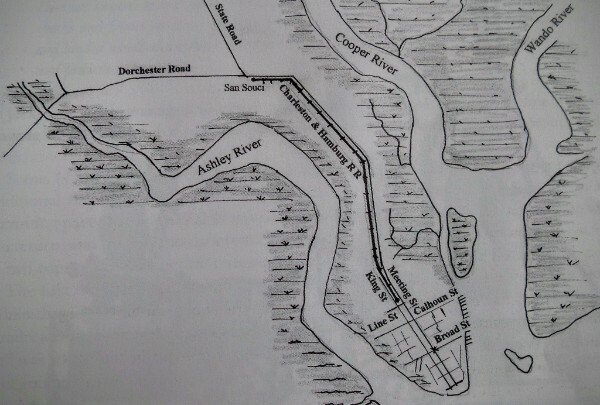 Albemarle Point, the location of the terminus of the C&S RR on the west side of the Ashley River, should not be confused with the site of the original settlement at Charles Towne Landing--if you remember from last week. (There was some confusion and lack of consensus regarding the site of the original settlement until the archaeological digs in the late 1960s confirmed the location on the grounds of Charles Towne Landing). After the Confederate-built railroad bridge was dismantled, this leg of the railroad became known as the Croghan Branch and was used primarily to transport truck farm produce from John’s Island. The land at the tip of this point was owned by Thomas C. Stevenson, Jr., who subdivided the area with gorgeous views of the river and city and built his home there in the 1940s. Albemarle Road has seen substantial changes over the last fifty years: Porter Gaud School relocated here on land donated by the railroad and industry has made way for residential use. Ruthie has handled a number of properties here as the area has undergone a transformation. She currently has a townhouse for sale in the luxury condominium complex at 498 Albemarle Road--she’s been involved in several transactions here, so please give her a call if you’re interested in a showing! 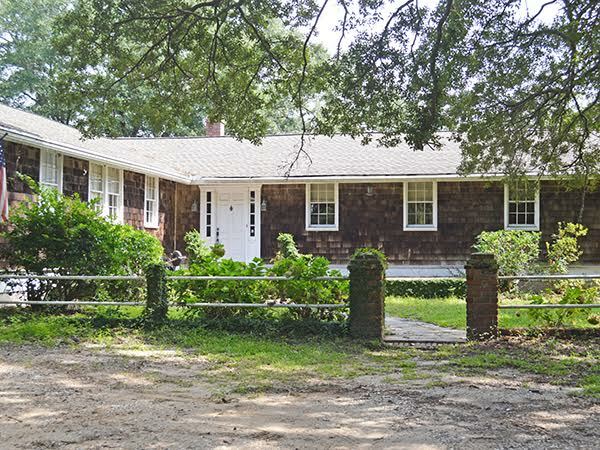 Last week, Ruthie assisted the sellers in closing the sale of one of the original dwellings at 4 Albemarle Road. This is an unusual home in that is was part of the original WWII Stark Hospital located on the Charleston Neck. When the former hospital property was bought for development as an industrial complex after the war, Arthur M. Fields bought one of the 22 buildings for sale and floated it down the Ashley River to the lot he had bought at Albemarle Point. The building had to be cut into four sections to be transported on the river barge and were reassembled on site in a way to maximize the views of the Ashley River and Wappoo Creek. The new owners of the 1941 structure plan to renovate the home. Congratulations to both the buyers and sellers of this novel residence!